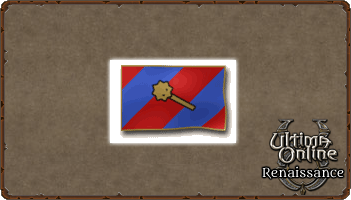 If you ask me, the only real man's weapon is the mace. Well, I suppose the axe is all right too, if you want to do things the easy way, but I don't hold with none of that mincing swordplay or cowardly archery - yeah, you heard me right, bladeboy, I said mincing. You don't like it, come talk to me in the pit. Interested? Didn't think so. Anyway, nothing like the jar of a full forearm swing and the sound of a crunching skull to make you feel like a real Warrior. Raising Mace Fighting: Mace Fighting is a Combat Skill and is difficulty based. Gideon's Advice: For training of weapon skills, it is best to have two characters fight each other and bandage each other and use Anatomy on each other. Use a wand or blacksmith hammer for fastest speed and lowest damage. GMing Maces, Tactics, Anatomy, Healing, and Parrying takes little time on UOR doing this. I would recommend gathering a lot of wool and/or cotton and making it into cloth before doing this to save money. This might be a faster method: Equip another character with high AR armor and put a weapon in their hands that they have 0 skill with. Hit them until you get to 81.0 shown skill, then equip them with a weapon they are GM with and continue to get the last 19 points. Having high dexterity significantly speeds up this process.